The result was outstanding – my coworkers inhaled them all and the few leftovers at home did not last long! These cuppies are a blast to put together and much easier to enjoy than the drink it’s modeled after. 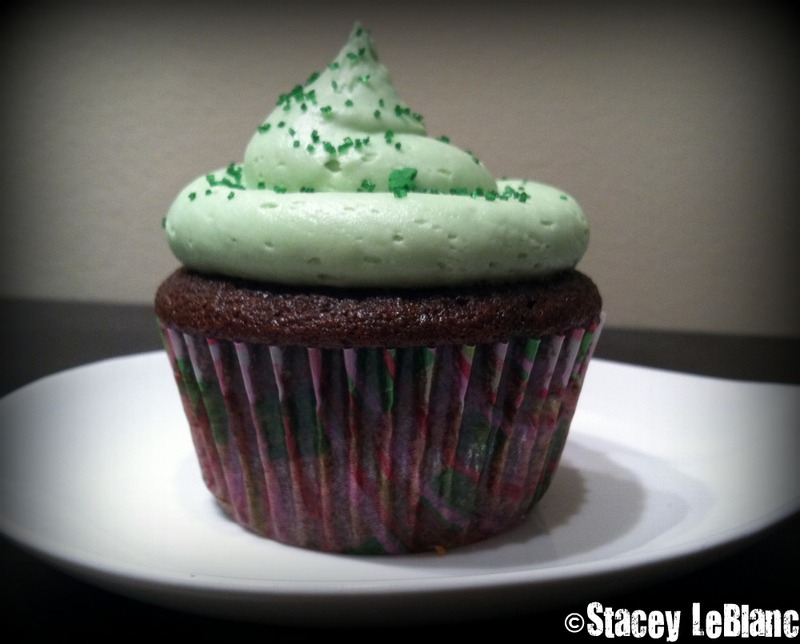 Even though St. Paddy’s has passed this year, this is a cupcake perfect for any celebration. Below is my version of Smitten’s recipe. Happy baking! (This makes enough for 12 cupcakes, double for all 24! 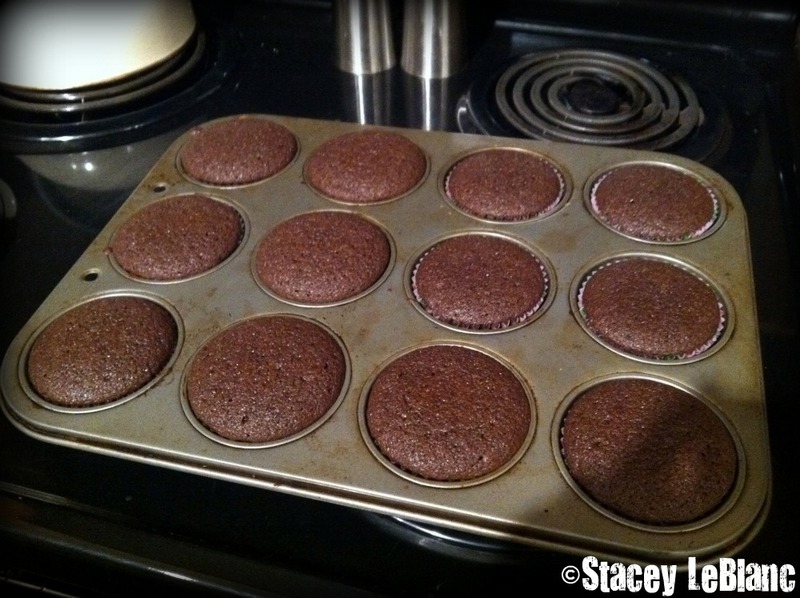 Make the cupcakes: Preheat oven to 350°F and prep cupcake pan (or pans, if you have two) with liners. Bring 1 cup stout and 1 cup butter to simmer in heavy, large saucepan over medium heat. Add cocoa powder and whisk until mixture is smooth. Cool slightly. Whisk flour, sugar, baking soda and 3/4 teaspoon salt in large bowl to blend. Using electric mixer, beat eggs and sour cream in another large bowl to blend until light and creamy. 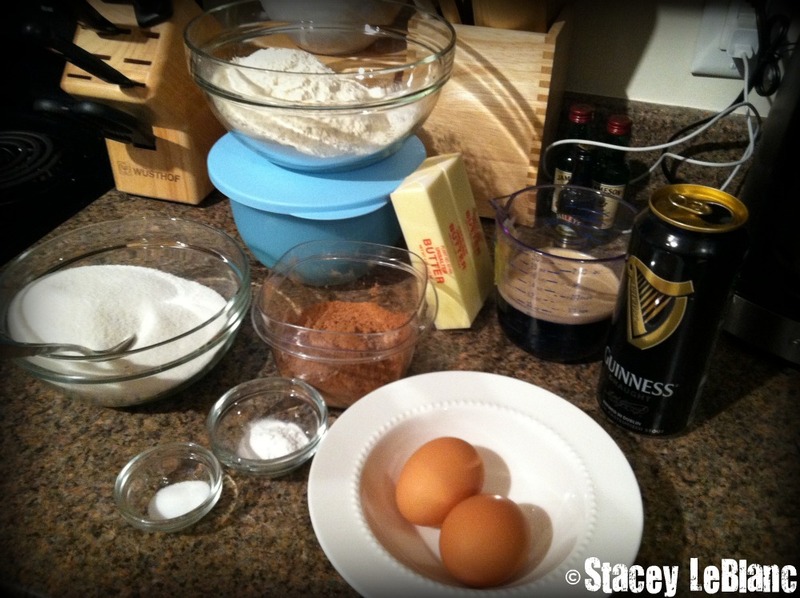 Pour in Guinness/chocolate mixture to egg/sour cream bowl and beat to combine. Add flour mixture and beat for about 1 minute on slow speed. Using a rubber spatula, fold batter until completely combined (be gentle, but make sure you really mix everything up, and don’t forget the bottom of your bowl!) Divide batter among cupcake liners, filling them 2/3 of the way. I like to use an ice cream scoop, it ensures that all the cuppies come out the same size. Bake cake until tester inserted into center comes out clean, about 17 minutes. Cool cupcakes on a rack completely. Make the ganache: Pour chocolate chips into a heat-proof bowl. Heat the cream until simmering and pour it over the chocolate. Let it sit for 1 minute and then stir until smooth. (If the chocolate has not melted enough to stir smooth, you can pop it in the microwave for about 10-20 seconds.) Add in the butter and whiskey, stir until combined. 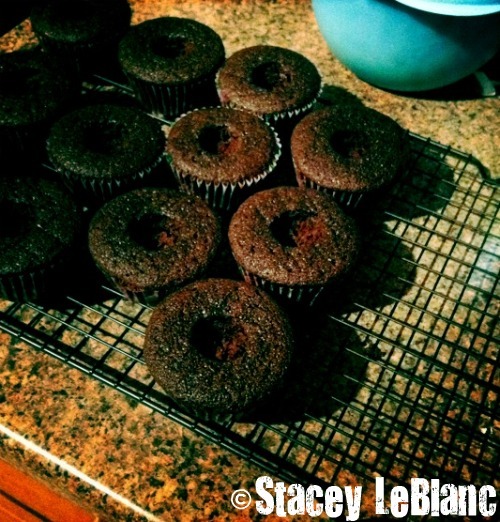 Fill the cupcakes: Let the ganache cool until it thickens up a bit. I put mine in the fridge for about 30 to 40 minutes, and stirred about once every 10 minutes per Smitten’s suggestion. Meanwhile, use a cupcake corer (thank you to my awesome neighbor Kate for letting me borrow hers! ), apple corer, a wide piping tip or a 1-inch round cookie cutter to cut the centers out of the cooled cupcakes. Make sure you really get in there, so each cupcake has a good amount of ganache filling! A little spoon or butter knife can help you get the center out. The centers ended up holding over my hubby ‘til the cupcakes were ready for him to “test.” 🙂 Give the ganache a good stir and fill up your cups! I used a spoon and dropped the ganache into the core. If it’s too thick, you can fill a piping bag and neatly fill the cores that way, whatever’s easiest. Hipstamatic made the cored cuppies look pretty Hipstah! 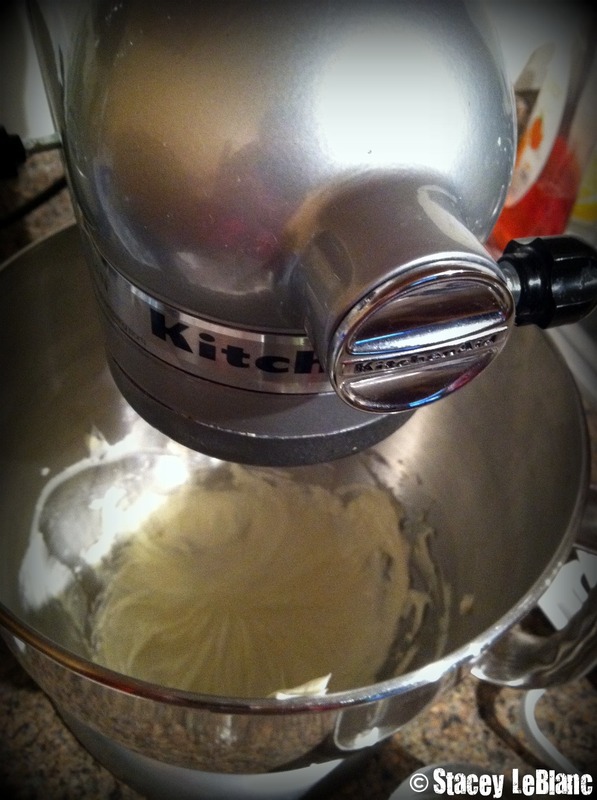 Make the frosting: Whip the butter in the bowl of an electric mixer, or with a hand mixer, for several minutes. You want to get it very light and fluffy. Read: Turn on your mixer and come back 10 minutes later. Use the whisk attachment so lots and lots of air gets whipped in there. Once the butter is whipped, slowly add your powdered sugar, a few tablespoons at a time. When the frosting looks thick enough to spread, dump in the Bailey’s and an extra splash of Jameson for good measure, and whip it until combined. Add more sugar or more liquid to thicken or thin out the buttercream. You’re done! Pipe or swipe the buttercream frosting on top of your cupcakes and you’ve got a celebration in front of you. Party time! Wanna print the recipe? 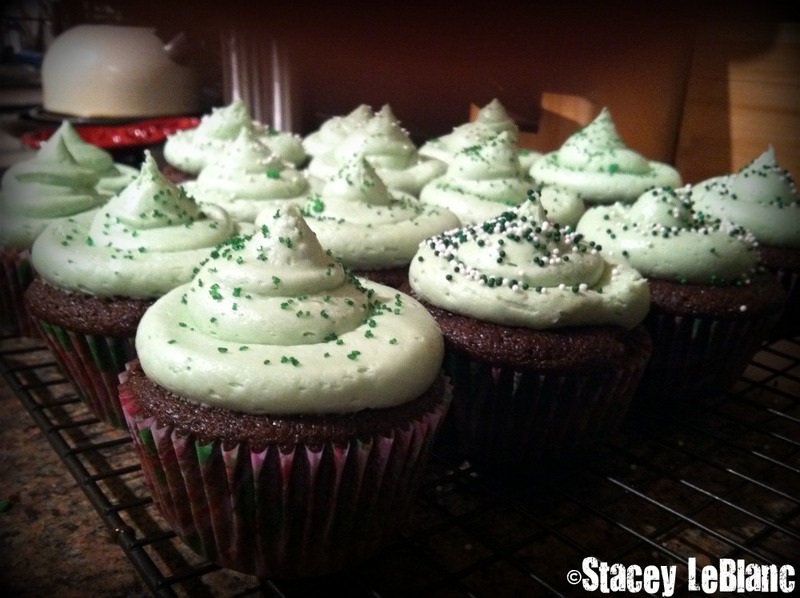 Download a PDF version of Stacey’s Irish Carbomb Cupcakes recipe now! 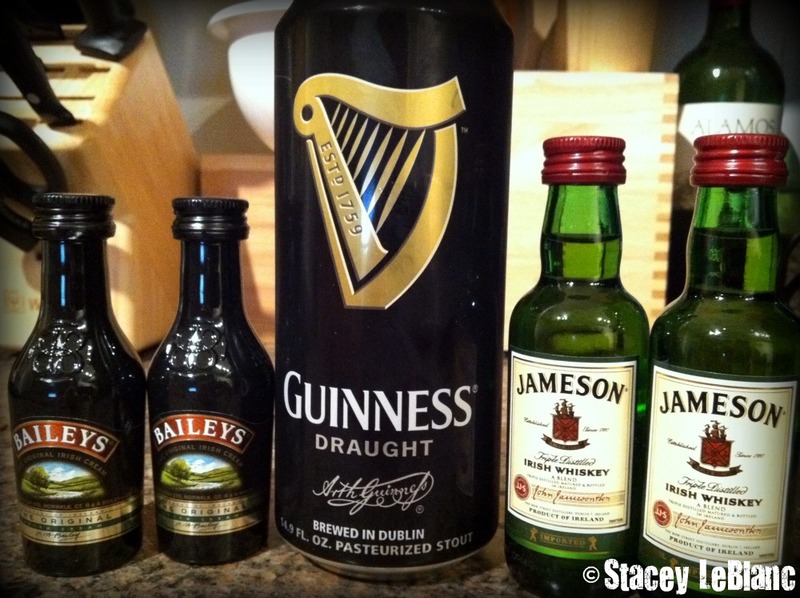 This entry was posted in Cuisine - Desserts, Recipes and tagged Ale, Bailey's Irish Cream, beer, buttercream, Carbomb Cupcakes, chocolate, desserts, DIY, frosting, Ganache, Google, guest blog, Guinness, Guinness Spice Cake, Irish, Jameson, recipe, Smitten Kitchen, St. Patrick's Day, Stacey LeBlanc, Stout, vanilla, Whiskey by Christina. Bookmark the permalink.